This Thursday, the Passion of the Weiss crew are bringing an LA lineup for the ages to The Echoplex. With Daedelus headlining and prodigal Southland rappers Boogie and Zeroh backing up the tweed-clad beatsmith, P.O.W. has brought out a bill that should match the energy of the best Low End Theory nights in the more spacious environ of The Echoplex. If you’re unfamiliar with Passion, Jeff Weiss and his posse of talented writers, polemicists, essayists and grumblers provide some of, if not the best, music criticism around and, more importantly, aren’t beholden to any sort of code, advertising constraints or, ahem, moral ground. 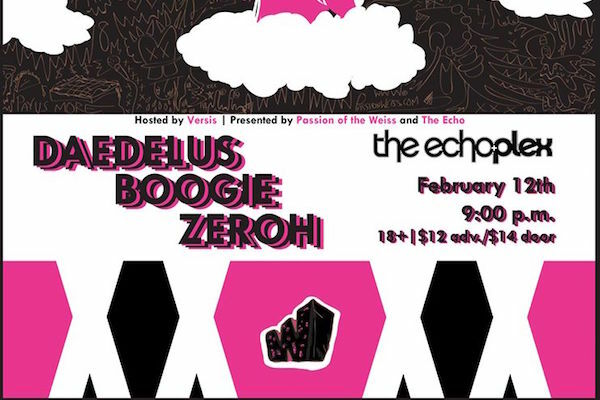 We’ve been gifted a pair of tickets to Thursday’s happening and all you have to do to be considered for said tickets is enter your favorite track Daedelus’ rich catalogue. For a little help re-remembering the depths of the West LA born producer’s discography, see here and choose wisely. Hope to see you all this Thursday.